At the annual Salon of fine watchmaking company IWC SIHH 2013 will present new models from the collection Ingenieur, created in cooperation with a team of “Formula 1» Mercedes AMG Petronas. Among the new products – models Ingenieur Chronograph Silberpfeil and Ingenieur Chronograph Racer. The first model is dedicated to the racing car Mercedes-Benz Silberpfeil (in German – Silver Arrow). In the 30’s of last century, the German car manufacturer has opened a new page in the history of motor sport, creating a new sports car with improved specifications. On four large international competitions W 25 has come to finish the fastest and set with several speed records. Since then, the race cars Mercedes-Benz became known silver arrows. Parallel with the legendary sports car Silberpfeil expressed in the design of the dial. Silver dial decorated with circular-grained – pattern decorates the dashboard of the legendary racing car. The back cover is engraved image of the legendary “Silver Arrows”. The second model Ingenieur Chronograph Racer is also associated with the world of motorsport. This is shown in the form of a modern engraving car “Formula 1» TM. New models are completed with metal bracelets with special clasps controller or rubber strap with textile / leather inserts. Ingenieur Chronograph Silberpfeil Ingenieur Chronograph Racer and have the same characteristics. 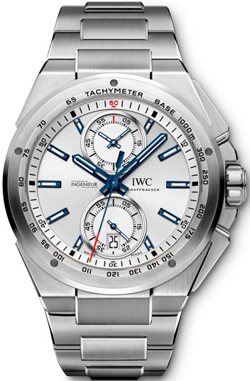 Functions: hours, minutes, 12-hour chronograph function with flyback, date.